The Senate still reportedly plans a vote next week on repealing the Affordable Care Act without a replacement plan. But it appears the GOP leadership will not have the votes it needs to bring even that fallback version of their legislation to the floor. So what happened after seven years of prioritizing the promise to repeal Obamacare? And what does it all mean for what's next? Few major legislative changes happen without the active support of the White House. We now have another demonstration of why this is true, albeit a demonstration in reverse. Trump made the decision to bet the first months of his presidency on a quick "repeal-and-replace" strategy. That decision is now being widely second-guessed. But Trump also failed to put shoulder to the wheel at any stage of the process. Unwilling to engage in the substantive issues, he famously decried the difficulty he had previously denied: "Nobody knew health care could be so complicated." He then praised the House bill at a self-congratulatory ceremony only to trash it later as "mean" while speaking with GOP senators. When the bill came to the Senate, Trump tweeted his hope that it would be "beautiful," (that comment was made about a week after the president said the Senate bill would have "heart" and that he wanted more money for the GOP health care plan — presumably to provide more care for everyone at a lower cost). But in the critical days when the bill's fate hung in the balance, he was more often tweeting about his various media feuds than about the bill. And on the night the final collapse came, he was finally meeting with senators for dinner — but all of them were already "yes" votes. Trump seems to have wanted to show up for the trophy ceremony, not for the game. But even if he had plunged into the trenches, his presence there might not have made the difference. Because the real challenge here was not the politics or the process but the problem itself. Health care is on its way to being a fifth of the total economy, and the Affordable Care Act, aka "Obamacare," is now part of its warp and woof. Ripping it out would disrupt the health care system's delivery of care and payment alike. Replace was always the hard part of repeal-and-replace, and we simply do not have a consensus on how to do it — even among Republicans. After the past few months, one is tempted to say especially among Republicans. People are always anxious about their health, their care and its cost, but when they actually get sick, lose their coverage or find their premiums rising, they get scared and angry. Politically, it is often enough just to make them fear those things might happen. Democrats found that out eight years ago, before they even got their bill across the finish line. The issue eventually flipped control of Congress. But now the Republicans come with plans to take insurance away from a far larger number of people and still no guarantee that the insurance will cost less or cover as much. That's why polls show the country prefers Obamacare to the GOP repeal bills by 2-1. This was going to give Republicans a case of cold feet no matter how hard Trump worked the bill. Mitch McConnell is the Senate majority leader and a past master of process and hardball politics. But his mythical status as a magician now looks more like a memory. In fairness, McConnell followed a game plan that has worked in the past and that worked as recently as this spring in the House. He fashioned a bill primarily to please the conservatives who dominate his caucus, then refined it to further accommodate holdouts on the right. His plan for holdouts in the moderate camp called for picking them off one at a time, earmarking billions for specific states or needs such as opioid abuse. At closing, the idea was to cast the last holdouts as preservers of Obamacare, traitors to the party and enemies of the state. (The president's Twitter finger was a fearsome threat in this regard.) But as it turned out, more than a few conservatives saw too much of Obamacare surviving, while moderates were still worried about Medicaid cuts. 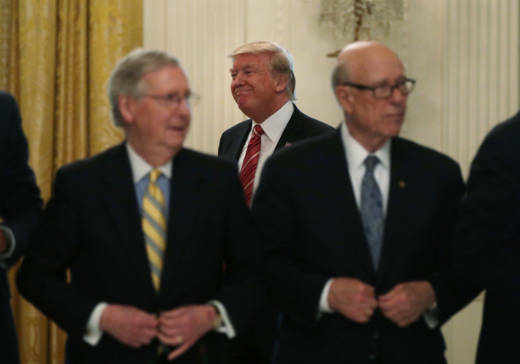 McConnell's magic was not potent enough. Democrats in 2009 and 2010 did not necessarily want to protect and preserve the private health insurance industry. Many of them would have preferred a "public option" format as a faster track to single-payer "Medicare for all." But to cobble together the votes to prevail, they went for a hybrid model of public-private insurance, which in the 1990s had been a Republican-proposed compromise alternative. This time around, the mirror image dilemma occurred for the GOP. Their most conservative cadre wanted full repeal of the Obamacare regulations and taxes and a rollback of Medicaid expansion as quickly as possible. Their more pragmatic senators feared the fallout from dumping millions off Medicaid. Even Sen. Shelley Moore Capito, whose West Virginia voters went overwhelmingly for Trump, had to think about having 30 percent of her state's families now on Medicaid. Other GOP senators were primarily fixated on the plight of those with pre-existing conditions, assured of affordable insurance for the first time under Obamacare. The GOP Senate caucus is home to profound ideological diversity. That can be a wonderful thing when all are united in opposition to the governing party. It is a far different creature when it must be united in order to pass things. So the divisions have now been vividly exposed by the coming of a Republican president. Yes, in 2015 it was easy for the Senate GOP to be unified in repealing Obamacare without a replacement. But no one doubted President Barack Obama would veto that. Now, Republican votes alone can make laws happen, and the prospect arises of voters not liking those laws. For more than a decade now, one major party or the other has been agitating for big changes in health care and insurance. The ever-escalating costs of high-tech care and the near-constant debate in the media guarantee the issue's salience will continue to grow. The average American wants good health care and has been increasingly promised "the best." But we often do not focus on the cost until necessity arises. Nor do we realize the true cost and reality of insurance coverage. As this changes, health care will demand more political attention, not less. Even without the friendly label of "Medicare for all," government-guaranteed health care single-payer polls better today than it has for generations. Democrats are increasingly likely to favor it as a logical extension of current programs for children, retirees and lower-income families. Among Republicans, however, it is still "socialized medicine" and it remains anathema — just as when it was first proposed in the late 1940s. But with escalating costs and political wrangling, more people are realizing that the health care system is a series of economic and political choices. The basic choice is between a for-profit health insurance industry that needs to make money (and has the power to raise premiums) and a single-payer system based on taxation and government regulation. This already exists as Medicare and the States Children's Health Insurance Program (S-CHIP) for the youngest. Those programs are both popular and enjoy bipartisan support in Congress. But extending them to cover the generations from young adulthood to seniority remains the key battleground in health care politics. Seven years ago, an open microphone caught Vice President Joe Biden congratulating President Obama on the passage of the health care bill that would define their legacy. Biden's salty choice of words is more politely repeated by the initials "BFD." But his assessment of the moment's importance was far from wrong. Seven years from now will we remember the events of this week as a matching bookend for Biden's BFD?